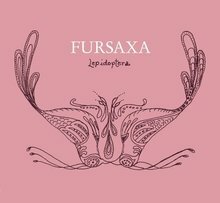 Fursaxa burst into prominence about a year and a half ago, I'd say, along with Devendra Banhart, Vashti Bunyan, Animal Collective and a few other so-called "freak-folk" acts. Not that these people hadn't been around for a while - some for several decades - but the spotlight shone upon them as the genre of the month. This isn't necessarily a bad thing - as always, these genre vogues work to introduce a lot of people to a lot of new music. In my case I scored with Vashti Bunyan and Fursaxa, most of the others not being to my taste. And now, gentle reader, if you don't have it already, I'm giving it to you. There are a few bands I've recommended before that I say transport me. This isn't necessarily a high compliment, it's just a description of the music. I've said it about Charalambides and Espers, both part of the folk set (though by no means new). The style of music is one you might expect at a gypsy witch doctor's (or something) - ethereal yet taut with content, deceptively complex though occasionally sounding simple to the ear. If you let it, it will take you away - and sometimes even if you don't let it; Espers has a way of making me stop whatever I'm doing. "Purple Fantasy" is the perfect example of this - jangling bells, an echoing flute, and a sound like a sea of bones command your attention although there is really no songwriting to speak of. It's a sound that's original, foreign, and difficult to describe. Other songs on the album have more structure - they sound like heathen singalongs, and you can almost hear the bonfire crackling. When it is her intention to do so, Fursaxa is also capable of beautiful vocal harmonies, as evidenced by "Moonlight Sonata" and "Pyracantha." Many tracks sound semi-improvised - wandering guitars, emotive wordless vocals, and no particular starting or ending point. "Poppy Opera" is the best of these, involving more sounds and more evolution within the song than the others. The last two tracks highlight her drone-guitar abilities - they sound like Charalambides covering Growing, or vice versa. Here is "Purple Fantasy" and here is "Pyracantha," by Fursaxa.